Readers’ poll: What is the scariest UK airport and why? The Dallas Morning News’ Airline Biz Blog has recently posted a list (along with videos for each entry) of the top 10 scariest airports in the world according to SmarterTravel. However, only one UK airport, Barra Airport on the Isle of Barra in Scotland, was mentioned. The reason? Its actually a beach. Hence, we want to ask our UK readers and regular UK flyers: What are the scariest airports in the UK and why? Is Barra really that scary compared to some of the other airports mentioned where there are volcanoes, buildings or even birds to navigate around? Feel free to post your comments below. Fly in for free at this popular and friendly event where Flight1 showcase the best in PC based flight simulation. They will be paying the landing fee for anyone flying in to see them on the day. The Flight1 2010 Open Day will be again hosted at Shoreham Airport with the aim of giving a relaxed environment and plenty of time to meet and talk about aviation, simulation and no doubt the weather too! With Shoreham Airport celebrating its 100 year anniversary as an operational airport and the summer skies buzzing with aircraft, it should be a great day. Last year Flight1 welcomed nearly 500 flight simulator enthusiasts and pilots alike, creating a very special and exciting atmosphere as tips and tricks of the trade were discussed and new friends made. Flight1 will have a wide range of simulation software and hardware on show for visitors to try from their GA training software, the latest aircraft and airliner add-ons to our range of ‘Environment’ packages that are transforming Flight Simulator X like never before. The best bit is that this will again be open to all and is totally FREE, including your landing fee if flying in for the event. Although free, Flight1 ask that in order to guarantee your entry that you register at www.flight1.com/openday – if you are planning of taking advantage of the free landing please let them know when registering. 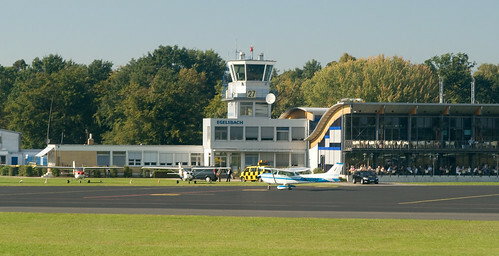 Lelystad (EHLE) is a great destination for GA pilots in the Netherlands. It’s very GA-friendly but still has customs on site and (relatively) cheap landing fees compared to Schiphol or Rotterdam. The aviation museum, pilot shop and cafe with terrace make it a nice place to spend a day if you’re a pilot or aviation enthusiast. I flew to Ostend Airport (EBOS) yesterday for a visit to Bruges. It’s about an hour’s flight in an SR-22 from Denham. Very pleasant too – up over the Essex and Kent countryside, dash across the channel from roughly overhead Manston to Koksijde airbase and then descending down into Ostend for an ILS approach. The airport is GA-friendly. We were met by a marshalling van and parked on Apron 3 near a few other training and club aircraft. The van drove us to a deserted customs hall where an immigration official checked our passports. We were out of the airport and in a taxi in about ten minutes. We got special GA tickets so that we could bypass check-in queues on our return. The journey to Bruges is about 20-25 minutes and cost about €90 each way in a taxi. I think this is pretty expensive and I think perhaps it may be cheaper to rent a car from Avis (who have an outlet at the airport) or to take the regular bus service from the aiport to the town. Landing fees, six and a bit hours parking and passenger charges etc. came to about €65 euros. There is no separate handling and you don’t need to book in advance – a flight plan is sufficient. We would have saved €12 if we had stayed under six hours because that’s how much free parking you get. Overall, though, I think Ostend compares reasonably well on price and facilities with similar regional airports in the UK such as Leeds Bradford, Edinburgh or Newquay. There are a couple of restaurants in or near the terminal. Bruges itself is very pretty and full of old buildings. On this particular Saturday afternoon, it was also full of tourists. We had lunch in a pretty open air cafe. Moules et Frites (or cheese omellet in my case). Afterwards we wandered around and found some quieter spots. I also found an excellent comic book shop where I bought a Biggles comic in Dutch. Just what I need to help with my studies! We also found a church that had replaced its pews and confessionals with an extraordinary series of artworks, including a lake you could walk over shrouded in mist. Bruges is definitely worth visiting in its own right. In practical terms, Ostend is easier to fly to than Le Touquet and hardly any further. If you take the bus from the airport, it needn’t cost very much. I strongly recommend the trip.